Sums up WWI pretty much. There have probably been a lot of people like me that have wondered why only particular theatres of war have received attention in computer games. There are plenty of WWII games, Vietnam War games and "modern warfare" games out there but not many based on WWI or the Korean War. 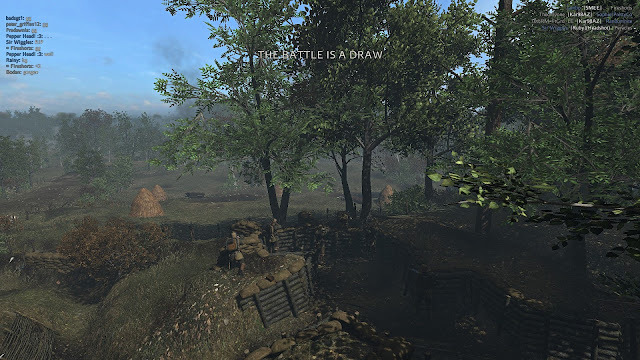 I always thought that WWI would be an interesting conflict to recreate in a computer game although the challenge would always be "how do you make trench warfare fun?" Okay, obviously warfare in real-life, isn't fun, especially trench warfare, but speaking from a gameplay standpoint, WWI wasn't a very "mobile" war when compared to WWII and consequently gamers could potentially find it boring if the safest option was to stay in a trench and take pot-shots over No Man's Land. Then comes along Dutch developers M2H and Blackmill Games with an Early Access game called Verdun, which happens to be set during WWI and is apparently fun to play. I played the game during its Early Access stage and while it had promise it was very buggy so I never revisited it until it was officially released in April this year. The game has improved by leaps and bounds in its current state but is it worth the $22.99 USD asking price? The game is a multiplayer FPS so it doesn't really have much of a plot but a lot of effort has been taken in making the setting, costumes, weapons and forces historically accurate, which is always a good thing. There's really only two game modes in Verdun and one of them is team deathmatch, so I won't go into that. The other, more tactical game mode, is called "Frontlines" and involves four squads of four from the Central Powers (Germany and its allies) going up against another four squads of four fighting for the Entente Powers (UK, France, Canada, etc.). There are different squad types you can pick from which will determine which classes make up your squad. Usually a squad will have a Non-Commissioned Officer (NCO) who acts as the squad leader, issuing orders and calling in mortar strikes or gas attacks, a sniper, a machine gunner and a trench assault or rifleman class. Staying close to your NCO and following his orders often rewards bonus points or buffs to squad members so this helps to encourage teamwork. Not only that, but if you happen to play with the same players all the time (e.g. with your mates) you'll unlock uniforms used later in the war and upgraded abilities (such as more potent artillery barrages) by gaining "co-op xp". In terms of the "Frontlines" game mode, here's how it works: the map has different lines of trenches and both teams start in the middle two trenches. One team acts as the attacker and is expected to cross No Man's Land to attempt and capture the enemy trench within a certain time limit. The other team's job is to of course defend against this attack and hold the line (you'll actually be shot for deserting your post if you attempt to stay in No Man's Land for too long). If the defenders successfully repel the attack, then what was formerly the attacking team need to retreat back to their trench and it's their turn to be the defenders. A team is declared victorious if they manage to push the opposing team out of the trench closest to their side of the map – any other result is considered a draw (which sums up trench warfare in general right?). The smaller play area (maps themselves are large but you'll only ever be playing in a section of it at any given time), bolt-action rifles and the ability to do melee damage as a secondary attack is a bit of a culture shock after playing the Battlefield games in recent years but it's a refreshing change of pace. I haven't had this kind of fun since playing Day of Defeat and that's one of my favourite games of all time! Another of the game's strengths is that it strongly encourages you to stick with your squad and play with the same players too. If you can manage to get three mates who enjoy the game as much as you do you'll have an absolute blast. It's actually quite satisfying when you, as an NCO, drop some smoke or gas in front of your enemy's trench enabling your squad to perform a flank attack. Tactics and teamwork are the order of the day in Verdun and that's a good thing in my books. Audio in the game is not as good as AAA titles and is reminiscent of older era games from the early 2000s, but the sound effects that are used are relatively authentic; the sound of the NCO blowing his whistle always manages to give me chills as it often signals your impending death as you vault over the trench into No Man's Land! No music is played during the game except when a round is about to end and when you join a particular squad (for example, joining the Tommies means you'll hear a wonderful bagpipes tune – unless you don't like bagpipes of course - then it's just friggin' painful). Music also plays on the main menu with my personal favourite being the classic "It's a Long Way to Tipperary". Maps are gorgeous (if you can call a cratered, muddy landscape, gorgeous) as the developers took a lot of effort in recreating the battlefields of WWI. However, the graphics themselves aren't going to be anywhere near AAA title quality (this is no Battlefield 4). I'd like to play this more but it really depends on server populations. So far it seems that there's always at least one full server at any given time (and often there's two or three) which means there's about 30-90 players playing at any given time. Most importantly (for us living in the middle of nowhere, aka Australia), the ping is bearable too. There are occasions when there's a bit of lag but I don't think this is a server issue and it's unfortunately more of an engine issue. Also the user interface is still a bit clunky and the game is still very much in development despite it being out of Early Access. You'll need to read forums and manuals to fill in the gaps, especially if playing as an NCO. While the game is still buggy and the game doesn't look or sound as good as AAA FPS titles, it's arguably more entertaining thanks to its brilliant take on how World War I was fought called "Frontlines". The game should appeal to those brought up on shooters like Day of Defeat or anyone wanting to experience an FPS set during WWI. Is the game worth $22.99 USD? : Yes, provided there are still people around to play with of course :).